EDITOR’S NOTE: This is the third and last in a series in which we chatted with Mainers who are semifinalists for a 2015 James Beard Foundation award. The finalists will be announced March 24 and the winners on May 4. We spoke with Wiley and Taylor about the perils of partnership, the beauty of brown butter and why it’s important to maintain a sense of humor in the kitchen. The interview has been edited for length and clarity. Q: What would you be doing if you weren’t chefs? WILEY: Originally, I was going to be a professor. I went to graduate school. I was good at school. And I got my master’s in rhetoric. I had cooked for a long time in Colorado, where I was a ski bum. I didn’t like the university life and I got to the place where I was thinking about cooking seriously, not just as a ski ticket. WILEY: I’ve cooked with people who say, “I want to be the chef. I don’t want to be the owner. I don’t want to have any input on anything but the menu.” I don’t understand. It just doesn’t make sense to me. TAYLOR: I want something that’s mine. I love the business side of running a restaurant. I enjoy being responsible for it. Trying to make good decisions, seeing those decisions pan out with the numbers. Q: Have you made bad decisions? WILEY: Certainly as cooks, we have. (He turns to Taylor) Like that chicken thing you made. The chicken sausage. That was a bad decision. TAYLOR: Not being well prepared enough for the opening of Eventide. Also, bad hires. WILEY: But I don’t regret anything about the opening. There was no way of knowing we were going to be so insanely busy. TAYLOR: We were understaffed and under-equipped. WILEY: Woefully under-equipped. We exceeded our projections by something like 700 percent. And that affects things like how much cooler space we needed, how much space we needed for cooks to do their work. We survived. We worked like animals for several months. We made it work. Q: Neither of you went to cooking school. Is cooking school important? TAYLOR: I think cooking school can be great. It’s a great way to get a base of knowledge. Having said that, I sort of feel the earning potential to the cost of culinary school is not in favor of the students. You go to business school and you know you’re going to come out making $80,000. You come out of culinary school, even the Culinary Institute of America, and you’re going to be at the bottom of the kitchen, $8.50 an hour, living in New York City. WILEY: I like the idea of learning in kitchens, in situ. If you want to get bookish, the amount of information out there is mind-boggling. You can find lots of second-hand cooking school textbooks. Like a dork, I read some of those. And if you want to see a chef taking down a monkfish, YouTube has got a bunch of those. TAYLOR: It’s not brain surgery. WILEY: Our business partner, Arlin (Smith), is the only one of the three of us who attended cooking school. The Culinary Institute of America. TAYLOR: And it got him out of the kitchen. Q: You are both owner/chefs. What’s the division of labor? TAYLOR: He focuses much more on Hugo’s, and I focus much more Eventide. We’ve hired an old sous-chef for Honey Paw. Both of us are intimately involved with the menu at Honey Paw. If I have a flash of inspiration that fits better at Hugo’s, I’ve no problem saying that. And the same for him. 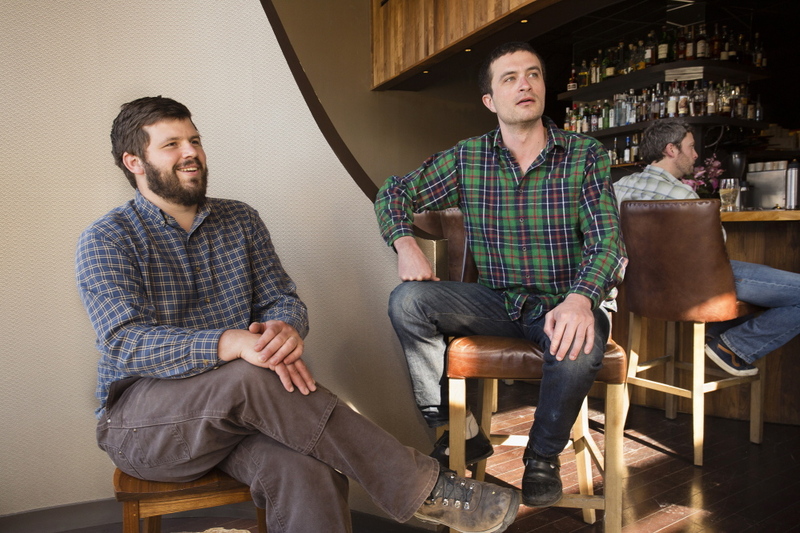 We try to cultivate a collaborative atmosphere in the restaurant. I really like it when a cook says, “I’d really like to do this.” It’s much better if the cooks have a sense of ownership because it’s going to taste better. WILEY: It sounds clichéd, but we have a really awesome community that helps us run the restaurants. TAYLOR: Sometimes I think I am the luckiest guy in the world doing what I love every day. And sometimes I think it’s a curse because I need to be here every day. It’s a lot of fun and it’s a lot of work. Q: Working this closely together must be like a marriage. What happens when you disagree? TAYLOR: There’s a third partner, so it’s a three-way marriage. WILEY: It can be (hard), yeah. TAYLOR: Three very different personalities so we can’t always get along great. WILEY: Can’t all be (he starts singing) sunshine and lollipops. WILEY: … these handsome, talented guys. What’s nice is the odd number. Somebody can get outvoted. We’ve done it long enough to know you can’t cling to every little decision. If nothing else, you can gloat later on. Q: Speaking of three, three restaurants on one block? What’s your model? WILEY: A lot of good decisions and a lot of good food but also a fortuitous abundance of good luck. Our landlord told us the space was going to be opening up and offered it to us. TAYLOR: Eventide has been so busy. We shared one small kitchen between the two restaurants. We were actually looking for a commissary kitchen, an offsite kitchen. We’d be making all this product and shipping it here, which would have been very difficult. WILEY: Now we can walk from place to place to place. Just having it contiguous is amazing. Every time (Portland chef/proprietor) Masa Miyake wants to go check on Pai Men he has to get into his car or take a walk. TAYLOR: As soon as you get in the car and go someplace, you are absent. Here at any moment I can be over a cook’s shoulder and telling them what they’re doing wrong. WILEY: (Laughter). Or how about telling them what a great job they are doing? Q: I read that the menus at Hugo’s are hand-stitched. Why go to the trouble? Q: Eventide, on the other hand, is so “playful” – the food, the decor, even the website. WILEY: It just seemed so natural to me. That’s what we do professionally – play with food, manipulate food. Humor has always been the draw to me of working in kitchens. When you stand next to the same person in a kitchen for 13 hours a day, 90 hours a week, you’ve got to joke. TAYLOR: More than anything, I want to be having fun. I want the cooks to be having fun. Q: Your lobster roll at Eventide, for one, is fun. What was its genesis? TAYLOR: We knew we wanted lobster roll on our menu. We had to have one. But when you get yourself into those regional specialty dishes – gumbo in New Orleans, cioppino in San Francisco – everybody has their own idea. It’s hard to please people. We wanted to take ourselves out of that conversation, to do something totally differently. We worked diligently to get the split top lobster roll. And tossing it in the warm butter is actually classic. WILEY: The butter – there was definitely a brown butter period at Hugo’s. It was ridiculous. We were just throwing brown butter at everything. TAYLOR: Once we tossed it in the warm brown butter and threw it on that steam roll, we knew. In those Best Lobster Rolls lists, ours comes up sometimes. Well, it’s not really a lobster roll, but (our thinking was) it still has to make those lists. Q: Your menus wander into Asia a lot, too. Have you traveled there? WILEY: I lived in Nepal for five months. But the incredibly drab diet of Nepal, rice and lentils, is not an influence. Both of us had a lot of French food crammed down our throats. French food is great food. I love it. But there’s just something different about Asia. The culinary history of China alone – there are four PhDs in that. TAYLOR: It’s so different from the way you train. Everything you were taught about French rules, you find yourself breaking those. It turns out that is just one set of rules. There are many sets of rules. Q: Getting back to the idea of fun in the kitchen reminds me of that hysterically funny video you made a few years back when you were up for that Food & Wine award (“The People’s Best New Chef 2013”). How did that come about? WILEY: It was right after campaign season, I think. (Thinking about) the whole chef celebrity thing. Crazy. We were nominated and Food & Wine said to us, “You need to campaign if you want to win.” So we decided to just run with it, to be a little tongue and cheek with it. Q: Is there a video in the works to try to secure the James Beard Award?